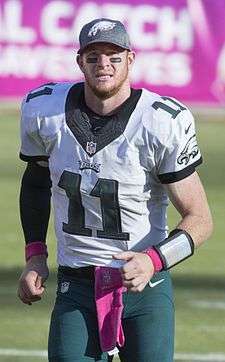 Carson Wentz (born December 30, 1992) is an American football quarterback for the Philadelphia Eagles of the National Football League (NFL). He played college football at North Dakota State University (NDSU) and was selected by the Eagles with the second overall pick of the 2016 NFL Draft, the highest selection ever for an FCS quarterback. Born in Raleigh, North Carolina, Wentz moved to North Dakota with his family at the age of three. He played quarterback and defensive back at Century High School in Bismarck, and also played basketball and baseball for the Patriots. As a freshman, he was 5 ft 8 in (1.73 m) in height, grew to 6 ft 5 in (1.96 m) as a senior, and graduated in 2011 as valedictorian of his class. Wentz attended North Dakota State, redshirting his first season with the Bison as they won their first FCS title under ninth-year head coach Craig Bohl. As a redshirt freshman in 2012, Wentz was the backup quarterback to Brock Jensen, and played in his first collegiate game on September 22. He completed all eight of his passes for 93 yards and threw his first touchdown in relief of Jensen in a 66–7 blowout victory over Prairie View A&M. Wentz finished the season completing 12 of 16 pass attempts for 144 passing yards and two touchdowns. Wentz was again the second string quarterback in 2013 and appeared in 11 games. He had his best game that season on October 13, against Delaware State, completing 10 of 13 attempted passes for 105 passing yards and a touchdown. Wentz ended the season completing 22 of 30 passes for 209 yards and a touchdown. Wentz became the Bison starting quarterback during his junior year in 2014. In his first start in the opener at Iowa State of the Big 12 Conference, he completed 18 of 28 pass attempts for 204 yards in a 34–14 victory on August 30. During the game at Western Illinois on October 10, Wentz caught a 16-yard touchdown pass from running back John Crockett and led the Bison to a 17–10 comeback victory. He had his best game at Missouri State, throwing for 247 yards and 5 touchdowns. In his first season as a starting quarterback, Wentz led NDSU to a 15–1 record. On January 10, 2015, he started in his first national championship game against Illinois State and passed for 287 yards and a touchdown and rushed for 87 yards and scored a touchdown on a five-yard run to give North Dakota State the lead with 37 seconds left. NDSU won their fourth consecutive NCAA Division I Football Championship game, 29–27. Wentz started all 16 games in 2014, completing 228 of 358 passes for 3,111 yards with 25 touchdowns and 10 interceptions. He was also the team's second leading rusher, with 642 rushing yards and six rushing touchdowns. As a fifth-year senior in 2015, Wentz had one of the best games of his career on October 10 against Northern Iowa, when he passed for a career-high 335 yards. The following week against South Dakota, Wentz suffered a broken wrist in the first half but managed to complete the game with 16 of 28 completions, 195 passing yards, and two touchdown passes as the Bison lost 24–21. After starting the first six games of the season and completing 63.7 percent of his passes for a total of 1,454 yards, and 16 touchdowns, he missed the next eight weeks of the season. He returned to practice in the beginning of December and was cleared to play in the national championship. On January 9, 2016, Wentz led NDSU to its fifth straight FCS title, running for two touchdowns and throwing for a third. He was named the NCAA Division I-AA Championship Game Most Outstanding Player for the second straight year. Wentz graduated from NDSU with a degree in health and physical education, finishing with a 4.0 GPA and earning recognition as CoSIDA Academic All-American of the Year for Division I football. In February 2016, most analysts had Wentz projected to be selected in the mid-first round of the draft. However, Wentz began to be regarded as a Top 10 prospect after his pro day. On January 30, 2016, he played in the 2016 Reese's Senior Bowl and finished the game completing 6 of 10 pass attempts for 50-yards. At the NFL Scouting Combine Wentz showcased his athleticism as he was in the top three in the 40-yard dash, the broad jump, and the three-cone drill among all quarterbacks. Wentz also reportedly scored a 40/50 on his Wonderlic test. On April 28, 2016, the Philadelphia Eagles selected Wentz with the 2nd overall selection in the 2016 NFL Draft. He is the first quarterback the Eagles selected in the first round of an NFL draft since Donovan McNabb in 1999, who was also taken second overall. He is also the first FCS quarterback taken in the first round since Joe Flacco in 2008, and the highest FCS quarterback taken in draft history. The Eagles traded three top 100 picks in 2016, a first round pick in 2017, and a second round pick in 2018 in order to move up in the draft order and get him. On May 12, 2016, Wentz signed a four-year deal worth $26.67 million, fully guaranteed, featuring a $17.6 million signing bonus. He suffered a rib injury in the team's first preseason game of 2016, but was fully healthy for the beginning of the 2016 regular season. On September 3, 2016, the Eagles traded quarterback Sam Bradford to the Minnesota Vikings. The same day, it was also reported that the team planned to start Wentz when he became healthy. On September 5, Wentz was officially named the starter for the Eagles season opener against the Cleveland Browns. He made his first regular season start on September 11 against the Cleveland Browns, throwing for 278 passing yards and 2 touchdowns in the 29–10 victory. He was named the Pepsi NFL Rookie of the Week for Week 1. Wentz threw for 190 yards and a touchdown in a 29–14 win over the Chicago Bears in Week 2, becoming the first rookie quarterback since 1970 to win his first two games of the season and not throw an interception. During Week 3 against the Pittsburgh Steelers, Wentz finished with 301 passing yards and 2 touchdowns as the Eagles won 34-3. He was named the NFC Offensive Player of the Week for his performance against the Steelers. ↑ Reyes, Lorenzo (April 13, 2016). "Carson Wentz has NFL teams on the hunt in draft". USA Today. Retrieved June 7, 2016. ↑ Kolpack, Jeff (October 31, 2014). "Bison QB Wentz kept growing in high school". Bismarck Tribune. Forum News Service. Retrieved 2016-01-09. ↑ SI.com. "Carson Wentz Career Stats". ↑ Jeff Kolpack (January 3, 2015). "Kolpack: Wentz has found his own success after taking over the starting job from former Bison QB Jensen". INFORUM. Retrieved 2016-01-09. ↑ "New starting quarterback at NDSU comes out strong". USA TODAY. October 1, 2014. ↑ Jeff Kolpack (April 27, 2014). "Wentz takes over reins at NDSU". The Dickinson Press. Retrieved 2016-01-09. ↑ "QB Carson Wentz rushes for winner as Bison beat Illinois State". ESPN.com. January 10, 2015. Retrieved 2016-01-09. ↑ "Bison earn fourth straight championship". Post-Crescent Media. January 11, 2015. ↑ Goodbread, Chase (December 12, 2015). "Zierlein: North Dakota State QB Wentz deserves first-round grade". NFL.com. Retrieved 2016-01-09. ↑ Peterson, Eric (January 9, 2016). "Bison earn place in college football history books with fifth straight FCS title". INFORUM. Retrieved 2016-01-09. ↑ "Carson Wentz". gobison.com. Retrieved February 27, 2016. ↑ "Carson Wentz Of North Dakota State University Headlines CoSIDA Academic All-America® Division I Football Team" (PDF). Retrieved 21 September 2016. ↑ "Carson Wentz". sports-reference.com. Sports Reference LLC. Retrieved September 2, 2016. ↑ "NFL Events: Combine Player Profiles – Carson Wentz". NFL.com. ↑ "Carson Wentz - North Dakota State, QB : 2016 NFL Draft Scout Player Profile". ↑ NFL.com. "What We Learned From the Senior Bowl". Retrieved January 31, 2016. ↑ Conway, Tyler (March 28, 2016). "Carson Wentz, Jared Goff's Reported Scores on Wonderlic Test Revealed". Bleacher Report. Retrieved March 29, 2016. ↑ Boyd, Ray (April 28, 2016). "Eagles Draft QB Carson Wentz With 2nd Overall Pick". CBS Philly. Retrieved April 28, 2016. ↑ Wilson, Ryan (April 20, 2016). "Eagles now have No. 2 pick after blockbuster trade with Browns". CBS Philly. Retrieved April 30, 2016. ↑ Sheridan, Phil. "No. 2 pick Carson Wentz signs rookie deal with Eagles". ESPN. Retrieved May 12, 2016. ↑ Sessler, Marc. "Carson Wentz signs rookie deal with Eagles". NFL. Retrieved May 12, 2016. ↑ Shorr-Parks, Eliot (August 13, 2016). "Eagles' Carson Wentz has a fractured rib, might miss rest of preseason". nj.com. Retrieved September 3, 2016. ↑ "Eagles to start Carson Wentz when he's healthy". nfl.com. September 3, 2016. Retrieved September 3, 2016. ↑ Patra, Kevin (September 5, 2016). "Carson Wentz named Eagles' starting quarterback". nfl.com. Retrieved September 5, 2016. ↑ Sessler, Marc. "Carson Wentz nabs win in debut as Eagles top Browns". NFL. Retrieved September 11, 2016. 1 2 Zangaro, Dave. "Carson Wentz Named Pepsi NFL Rookie of the Week". nbcphiladelphia.com. Retrieved September 16, 2016. ↑ Wesseling, Chris. "Wentz outplays Roethlisberger in Eagles blowout". NFL. Retrieved September 25, 2016. 1 2 Berman, Zach (September 28, 2016). "Carson Wentz named NFC offensive player of the week". philly.com. Retrieved September 28, 2016. Wikimedia Commons has media related to Carson Wentz. "North Dakota State Bison bio". Archived from the original on March 27, 2016.